Discussion in 'General Discussion' started by Admin, Oct 8, 2018. Democrat Phil Bredesen is running for U.S. Senate in Tennessee with a D-rating from the NRA and a campaign built upon pledges of more gun control. The Chattanooga Times Free Press reports that Bredesen wants universal background checks, which is leftist-speak for outlawing private gun sales. He announced this position in March and cited the February 14, Parkland high school shooting when he did it. What Bredesen did not mention was the fact that the Parkland attacker acquired his gun through a background check at retail, not via a private sale. So Bredesen’s background check gun control would not have done anything to prevent that attack. Wonder if Taylor Swift got this message? She probably has armed security, so doesn't need to care. I think he's in the wrong state to be running on an anti gun platform. wiryone1, Lip, dingbat and 3 others like this. Looks like the party of socialists have their hooks into Phil. He was a pretty good guy as mayor of Nashville and governor of Tennessee- but his stance on 2A is a big 'NOAP' for me. Lip, BUMPA01603 and Horrible like this. Bredesen's clear pro Kavanaugh position did cause that despicable moov-on org to pull their support and de-commit some major coin for advertising. Bredesen took a 'pro' Kav stance early in the process, which took some balls for a D when many weasely R's were still checking the wind. That 2A record, however, will certainly lose many of his votes coming from anywhere near the center to the right. Yep, wrong state to do that. There are some commies in Nashville, Knoxville, and Memphis- but most of the state bleeds red and any Dixiecrats know to at least keep their mouth shut if they are not strong 2A. The Chattanooga Times Free Press reports that Bredesen wants universal background checks. Same old sad song, just a different democrats voice. Give us your guns. Where have we heard that before ? We heard from Hitler, we heard it from Stalin and a dozen other tin pot dictators after these tyrants died. Give us your guns isn't just a phase, it should be a warning to anyone who believes in freedom. As a former MA resident who has been living in TN for the last 4 years I'm obviously hoping that Bredesen loses to Blackburn. It was pretty close for a while, but the latest polls have Blackburn up by 8 points so it is hopefully a done deal. The Kavanaugh hearings put him in a tough spot. If he didn't come out for Kav (he would have voted to confirm) he would have been signing his own death warrant, but at the same time I'm sure that pissed off the D's and the big outside money. If he keeps sagging in the polls I'm sure they are going to cut bait and put the money someplace where they have a better chance of winning. I don't understand why the D's keep pushing for gun control on a national level after losing a lot of winnable gun friendly swing states in 2016. He was a really reasonable for a D when he was Gov of TN. He had an A rating with the NRA, was always a fiscally conservative small government type, is pretty non-partisan in this age of hyper partisanship, and is moderate to the point he has been campaigning on his own merits and not bashing Trump. So if anyone is wondering why it has been so close that is why. In almost any other state he would be running as a soft R and is way more conservative than someone like Baker. I don't think it is possible to be any more moderate in today's climate than Bresden. But in order to get that out of state money you need to sell your soul and it looks like he has done that to some extent. If the D's didn't go all in on gun control and it was only part of a local and not national policy I could easily see him winning here. Blackburn is a staunch 2A supporter so she will get my vote but a lot of her personal beliefs on some stuff are pretty cringy and might turn people off. That being said, it isn't anything that really matters in the end and she will vote for the actual stuff I'd like to see get done. I didn't move out of MA to suffer under an AWB ever again and will always vote accordingly. On a side note, yesterday a minivan of young attractive twenty somethings in shorts, tank tops, and MAGA hats were going door to door in my neighborhood asking if I was happy with Trump (and why and why not), passing out fliers, and telling everyone to vote for Blackburn. I told her that is my plan, but I'd imagine that if it wasn't she would have been polite and courteous during the entire conversation. Imagine what a minivan full of Warren supporters would look like and act like if you told them you were pro gun and a Trump supporter. mothybee, Lip, Jason Flare and 5 others like this. Imagine what a minivan full of Warren supporters would look like and act like if you told them you were pro gun and a Trump supporter. If Tay Tay keep this up, I'm going to dump her! I just saw this article online. Hannity is going to play this entire thing on his show 10/11. It’s pretty much hard to refute what this shitbag says. The best is going to be if/when Trump mentions this at a rally. Horrible, PreliatorX and Lip like this. Isn't that the age old democrat get elected technique? Sound like and act like a centrist on the campaign trail but once elected turn hard left because there's no way to get unelected. They've been doing that for decades. wiryone1, Jason Flare and Horrible like this. You are absolutely right, however not too often that its documented before they are elected that they are flat out lying just to get votes. Later on they can always play the 'xyz' has changed my mind card and people eat it up. Sad part is, most of those fence voters will never even be aware of this. Aside from Hannity or Breitbart I don't expect it to get much coverage. Real journalists should be climbing over each other to be the first to get this information out to voters, but instead the political activist media will probably do another segment on Stormy Daniels or how it's unfair Mexico only get one letter in the new USMCA trade deal. Ah, for the good old days. I forgot about the duck test. Lost my mother-in-law that way. wiryone1, WSCJonathan and Jason Flare like this. A spokesman for a Democratic group that is supporting former Tennessee Gov. 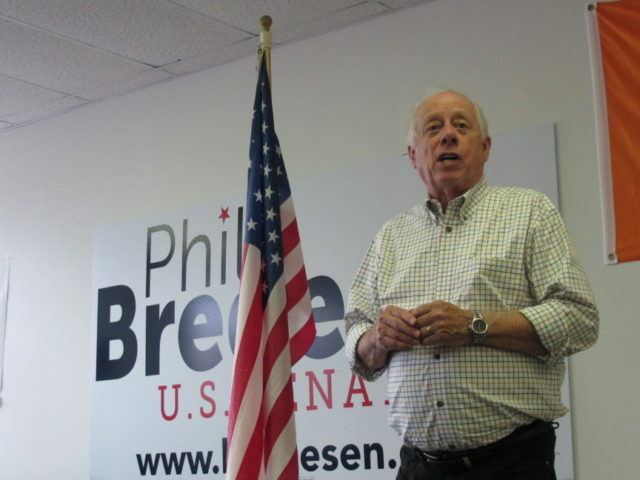 Phil Bredesen in his run for a U.S. Senate seat referred to “white male” gun owners as "Murican gun nuts" in response to a Facebook post asking people to identify “the biggest terrorist organization on the planet,” according to a report. Mark Brown, communications director for Tennessee Victory 2018, a group backing Bredesen's run against Republican U.S. Rep. Marsha Blackburn for the Senate seat occupied by retiring Republican Sen. Bob Corker, posted the comment in 2015, the Washington Free Beacon reported. This is a plea to Admin to post a new featured thread. The old man in the picture is irritating me!